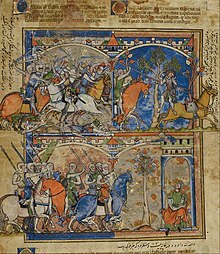 The Morgan Bible (mostly The Pierpont Morgan Library, New York, Ms M. 638), also called the Crusader Bible or Maciejowski Bible, is a medieval illuminated manuscript picture book Bible of 46 surviving folios. The book consists of miniature paintings of events from the Hebrew bible, set in the scenery and customs of thirteenth-century France, depicted from a Christian perspective. These are now surrounded by text in three scripts and five languages: Latin, Persian, Arabic, Judeo-Persian, and Hebrew. Forty-three folios are in the Pierpont Morgan Library, with two folios in the Bibliothèque nationale de France (MS nouv. acq. lat. 2294). A single folio is now in the J. Paul Getty Museum, Los Angeles (MS 16). Two folios are thought to be missing from the original work. The work known as the Morgan Bible, Crusader Bible, or Maciejowski Bible is part of the Pierpont Morgan Library in, New York (Ms M. 638). It is a medieval picture Bible of 48 folios. The book consists of paintings of events from Hebrew scripture, given a setting in the customs and costumes of thirteenth-century France, and concentrating on stories of kings, especially David. Originally only a picture book, the images are now surrounded by text in three scripts and five languages: Latin, Persian, Arabic, Judeo-Persian, and Hebrew. Siege, Samuel crowns Saul king, and they sacrifice together. Originally, the bible contained only miniatures, organized in a consistent visual rhythm from page to page. Within 100 years, the book acquired marginal inscriptions in Latin describing the scenes illustrated. Cardinal Bernard Maciejowski, Bishop of Kraków, had the book given as a gift to Abbas I (Shah of Persia) in 1608. Abbas ordered inscriptions in Persian to be added, mostly translating the Latin ones already there. Later, in the eighteenth century, inscriptions were added in Judeo-Persian. The book has traditionally been thought to have been created in Paris in the mid-1240s for Louis IX of France. A suggestion by Allison Stones, developing indications by others such as François Avril, that it was instead illuminated in northern France, c. 1250, has not won general acceptance. ^ Morgan Library, "About the Book"
Wikimedia Commons has media related to Maciejowski Bible. This page was last edited on 11 March 2019, at 23:57 (UTC).